Don Cheadle and Mark Ruffalo have been spotted in Atlanta, leading us to believe that they’re in town for the Avengers: Endgame reshoots. The Russo Brothers have been quietly taking care of some extra work on the most anticipated movie of 2019, but the actors have been a little less quiet about taking care of some extra business, including Zoe Saldana and Karen Gillan who posted on social media that they were finally finished filming. Jeremy Renner has also posted a picture from the set. An excited Marvel Cinematic Universe fan spotted Don Cheadle and Mark Ruffalo on the streets of Atlanta and was able to snap a picture with War Machine and Hulk. It isn’t clear just how much of Avengers: Endgame was spoiled by Ruffalo, but Cheadle has a pretty big smile on his face, leading one to believe that the spoilers happened after the picture was taken. The duo are more than likely in Atlanta to participate in the Endgame reshoots, so we might get to see some more comedic moments between their two characters on the big screen. 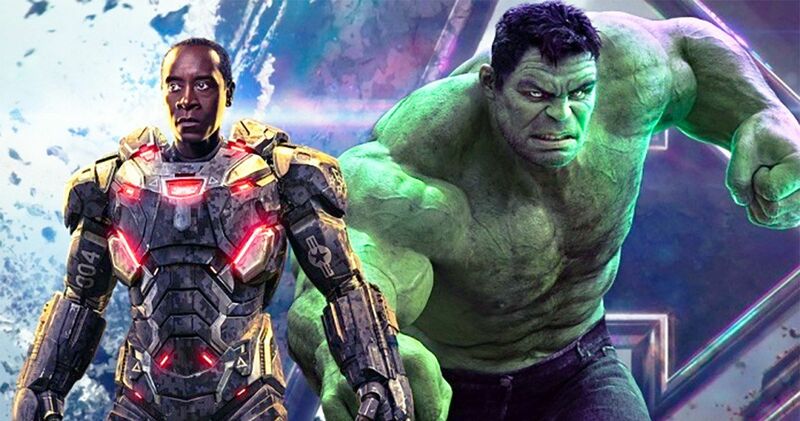 Don Cheadle recently revealed that he refuses to do press with Mark Ruffalo after he spoiled the end of Infinity War over a year before the movie was released. Since then, and even before then, Ruffalo has spoiled plenty of MCU moments, giving him the reputation as a serial spoiler. However, the actor recently took some time off of social media and he hasn’t been spoiling anything lately. Instead, he’s been having fun with his reputation, which Cheadle doesn’t really find to be too humorous. While some fans may be discouraged that Avengers: Endgame reshoots are still going on three months before the movie hits theaters, it’s a completely normal situation for a movie of its scale. The Russo Brothers will more than likely be working on Endgame up until the weeks leading up to its release. And from there, they’ll jump right into doing the promotional tour, which sounds pretty exhausting. The directing duo are due for an extended vacation after working virtually non-stop for the last handful of years. Avengers: Endgame is going to close the book on the first 10+ years of the Marvel Cinematic Universe. Obviously, Phase 4 is on the way, but the MCU is going to be a much different place after the events of Infinity War and Endgame. While we don’t know what the story will be, we do know that Captain Marvel is going to take the lead and take on a Tony Stark-like role from here on out. While we don’t know what’s going to happen, we might be able to get some information out of Mark Ruffalo between now and then, so we’ll keep an ear out. You can check out the photo of Ruffalo and Cheadle below, thanks to Reddit.